Prairie's Edge Organics - Worm Castings Page, Vermicompost, Pure Black Castings, Vermiplex, and anything organic is our specialty. There is a huge difference between Vermicompost and Pure Worm Castings. Clarification is needed for terminology used with the terms worm castings and vermicompost. The term "vermicompost" is used much like "compost". Most people have no idea of how it is going to perform until they use it. Vermicompost contains worm castings and other organic matter that has been partially or fully composted. Who knows how much pure worm castings are found in vermicompost? The amount of pure worm castings will vary from batch to batch and from one vermicomposting facility to another. Introducing a handful of redworms into a compost pile does not produce a good quality of vermicompost. Quality in - quality out that is what we are all about. The Best Pure Worm Castings in Today's Market. Pure worm castings will look like black coffee grounds! Take two wide mouth 20 oz. drink bottles and place 4 oz. of our pure worm castings in one bottle and the same amount of another producer of worm castings or pure worm castings. Fill both bottles ¾ full with tap water and shake well and let stand for 5 minutes. Check for weed seeds and other materials (compost) not consumed by the worms. This is typical of vermicompost. Check for sand will settle out first. It is common for manure based fertilizers to contain a lot of fine sand or sand added for weight. Then pour off the liquid and dump the sediment out and examine. It if feels and looks like mud, then that is probably what it is. If it retains much of the original characteristics then it is pure worm castings. Each pure worm cast is coated with calcium and takes time to dissolve. 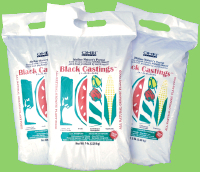 Bulk available in one-ton commercial tote bags. Our castings have a low moisture content so you are receiving more castings per ton. Can be used in landscaping & golf course turf management with present application methods. Distributor prices available for case & pallet lots. Please call or e-mail for pricing. We also do custom bagging.